Had Lenny Kravitz not sold his soul for commercial gain he might just have been a match for the imperious Conny Bloom. Then again, had the charismatic leader of the Electric Boys enjoyed sustained chart success, rather than critical acclaim and cult status, he could be lounging on a beach in the Bahamas or managing an organic farm in Brazil (Lenny, it seems, does both). But who is the happier? Watching the colourful Bloom lead a small but perfectly formed crowd through a career-spanning set, it was impossible to believe that the Swedish frontman would rather be anywhere else than trawling the clubs of Britain in support of his band’s latest crowd-funded album. And so to local heroes Edenthorn and an early shift inside the Tank. Frontman Kyle Michael Tague captured the imagination from the get-go and the band’s on-trend fusion of 90s alt rock and modern metal continues to evolve. A permanent fixture on the North East scene, discovering a wider audience is the biggest challenge facing the hugely talented homegrown heroes. Opening for Sweden`s Funk Rockers the Electric Boys, shows just how far Durham`s very own Edenthorn have come in the last year or so. That their star is very much in the ascendance is down to their ability to craft some seriously classy songs and perform them in such an impressive way. Power and especially Hearts Still Beating from their latest release, Exist, show a genuine grasp of melody and melodrama delivered by the rich tones of Kyle Tague that mark Edenthorn down as ones to watch. Their last show in Newcastle saw the Electric Boys looking back, celebrating the 25th anniversary of their second album, the wonderfully and very aptly titled Groovus Maximus but this year they had their sights set firmly on the future. With a decent chunk of the set taken up with songs from their latest album, The Ghost Ward Diaries, it`s clear that the Electric Boys are on something of a creative roll. Hangover in Hannover is the perfect opener, big, bold and brassy whereas the more reflective Gone, Gone, Gone, a song to a lost friend, shows there`s more to them than Funky swagger. Of course, the Funk element drills deep into their soul and Groovus Maximus, Electrified, Knee Deep In You and Rags To Riches Rocked hard and grooved deep. Angel In An Armoured Suit featured a glorious, sleazy Aerosmith-esq riff while Mary In The Mystery World brought a cool shot of Psychedelia to the show perfectly matching singer, Conny Bloom`s, flamboyant image. You Spark My Heart`s soaring chorus was as uplifting as its name suggests but it was left to Rock club floor filler All Lips `n` Hips to seal another sizzling, high voltage night. The Best New Band category was an open vote with more than 100 acts vying for the prestigious honour. Fast ascending blues rockers Kris Barras Band, fronted by the titular Kris Barras, came out on top ahead of Those Damn Crows and Edenthorn in second and third spot respectively. EDENTHORN RECEIVE FEATURE IN PLANET ROCK MAGAZINE. Edenthorn have premiered their ‘Power’ music video exclusively on Planet Rock. As you may have heard on Wyatt’s New Rock Show on Monday night, ‘Power’ is a slick and instantly infectious anthem from the Durham based quartet that comes complete with life-affirming lyrics. The accompanying Aytball Film directed video sees Kyle Tague, Dylan Gardner, Faiba Gabrielle and Mark Tague belt out ‘Power’ in an atmospherically lit gig venue before it builds to an explosive, highly-charged finale. ‘Power’ is lifted from Edenthorn’s second studio album ‘Exist’, which is available to buy right now. The 11-track record also boasts the Kerrang! Radio premiered track ‘Mind Like A Minefield’ and the groove-driven single ‘The Unknown’, which Wyatt also played over the summer. Commenting on ‘Exist’, bassist Faiba says: “Our main aim is to make sure that our listeners never get bored. There is nothing worse than listening to an album where every single song sounds like the song before. EDENTHORN ON PLANET ROCK RADIO REQUEST SHOW! This week we’re shining the Ones To Watch spotlight on Durham based rock and rollers Edenthorn. Edenthorn are Kyle Tague (lead vocals), Dylan Gardner (guitar), Faiba Gabrielle (bass/vocals) and Mark Tague (drums). There are close-knit bands and then there’s Edenthorn. As well as consisting of two sets of siblings (brother and sister Dylan and Faiba, and brothers Kyle and Mark), Kyle and Faiba are also partners. Bolstered by these strong connections, the Durham quartet a highly-polished musical outfit as typified by excellent current groove-driven single ‘The Unknown’, which was played on Wyatt’s New Rock Show this week. Embracing the quiet/loud dynamic, Kyle’s Weiland-esque drawl is complemented perfectly by harmonious backing vocals from Faiba as they deliver a song packed with infectious riffs and imbued with an overtly positive message. Just like its Kerrang! 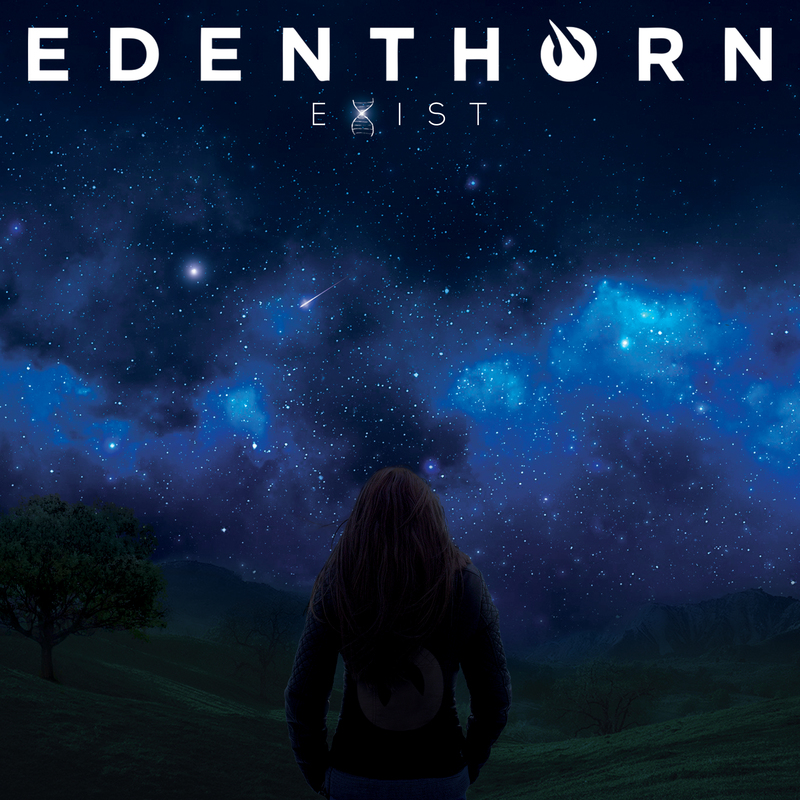 Radio premiered predecessor ‘Mind Like A Minefield’, ‘The Unknown’ is a perfect introduction to Edenthorn’s second studio album ‘Exist’, which was unleashed to the world in April. Throughout its 11 tracks, the eclectic album is a beguiling listen and showcases every side of Edenthorn’s art. Some people have claimed that rock is dead. Then bands like Edenthorn come along and prove that this is not the case. This four-piece showed the world what they were all about with their EP Whats On Your Mind? They did not make their fans wait long for new music, as they released their debut album the following year. The Mazeshows how much they had grown over the year with their strongest collection of songs. This included the stunning charity single “After The Storm,” which was used to help raise mental health and suicide awareness. Exist is a no-nonsense album that rocks. It an era when most bands of this genre tend to infuse electronic or bluesy elements, it is great to hear this back to basics sound. They had their goal when creating this release and they have executed this plan perfectly. This intent is clear with the opening track “Out of the Dark” that brings killer riffs and thunderous beats to grab your attention. With influences that include Foo Fighters, Biffy Clyro, and Stone Temple Pilots, you can understand why they love rocking out. Another example of this is “Heart’s Still Beating,” which is one of the highlights from the album. This has been getting a lot of attention because of its huge anthemic sound and epic hooks. As well as their big sound, this is a band that also has a reputation for their infectious choruses. After a few listens you find yourself singing along. This is also a credit to how Kyle Tague uses his voice for maximum effect. He is a front man who knows how important it is to get the listeners and crowds engaged. As much as he knows how to rock out, his best performance is during the track “Garden of Heaven.” A slightly softer tone that is filled with emotion that packs a punch at times. The backing vocals from Gardner also help to make this song something special. Exist is full of outstanding songs with some that can become overshadowed by the likes of “Mind like a Minefield.” This shows Edenthorn at full throttle and it is relentless from start to finish. All the boxes you want a rock track to tick are filled with this one. A personal highlight, “Speak to Me” shows off a different side to the band and one that should be explored more in the future. It gives the opportunity for these musicians to spread their wings with something that is mostly instrumental, except for some minimal use of vocals from Kyle Tague and Gardner. A flawless moment that proves less can give you more. Exist shows that Edenthorn are going from strength to strength. They are a name that will be mentioned a lot more after this release and deservingly so. If you love rock, then you NEED this album. North East four-piece Edenthorn drop their sophomore LP Exist April 20th and it is well worth waiting for. A gargantuan LP of musical quality, it is a flawless example of fine UK talent showcasing the top-flight bands within the local industry right now. The vocal talents of front man Kyle Michael Tague are showcased beautifully against the backdrop of sublime song writing. Each track just gets stronger and stronger as the LP ebbs and flows across eleven cracking songs. Reminiscent of the likes of huge American bands like Daughtry or local lads like Mallory Knox and beyond, the quality is there in abundance for all to see and there is no doubt Exist will propel this quartet to new heights. Exist is self released April 20th. 9) Where Did You Go? It opens with Out Of The Dark, a song that’s easy to connect to, with its smooth vocals from lead singer Kyle Tague and Dylan Gardner’s invigorating guitars in support. It’s catchy, and bodes well for the rest of this record. Hearts Still Beating and Power are more dramatic, and clean-cut, getting to the core of what Edenthorn are about. Mind like a Minefield and Live in the Now have more of a punk tone, and carry the characteristics of true bangers: they’re heavy, toe-tapping and quick. It’s not just the music that’s weighty either; it’s the emotion too. But whilst the tone at times may be tender and thoughtful, the music remains gripping and invincible. Where Did You Go is a lighter and more hopeful tune, and Speak To Me is brings the record to a smooth and calm conclusion. If you haven’t listened to Edenthorn yet, then there’s something missing from your playlists. Exist is out Friday 20th April. EXIST is the dazzling second album from Edenthorn, a young Durham band unashamed to rock; an album that blasts out of the box with a big riffing opener Out Of The Dark. Soaraway melodic choruses and epic guitar lines feature throughout, and recent single Heart’s Still Beating reaches for the stars and rocks riotously. Power is well named, but even on this energy-enriched track the four-piece know how to wind down the gears and be more reflective before putting the pedal to the metal. There is plenty of breadth and room for variety without sacrificing the unity of the album. Prepare for a storming, stomping big finish with Speak To Me, a slow burner which sparks into a firestorm. No apologies. No compromise. There`s always something of a buzz around an album launch party. Whether it`s the sense of excitement that this album could be “the one” or just that feeling of relief that all of the hard work in creating the music is finally over and now people can get to hear the finished product. Certainly, the Cluny was fizzing with anticipation before Durham based Edenthorn unveiled their second album to a collective family, friends and fans. With their new record, Exist, out in a couple of weeks, lucky fans at the show could get their hands on the album early and those who did would certainly not have been disappointed. 2015`s debut The Maze showed a lot of promise with the likes of Hideout and Cortisol showing a real maturity in the song writing department but over the ensuing three years the band have taking huge strides forward and developed into a band where everything is clicking into place at exactly the right moment. Out Of The Dark, the Foo Fighters tinged Mind Like A Minefield and The Noise In My Head certainly packed a punch but where Edenthorn really scored was on the huge hooks and towering melodies on the likes of Power where vocalist Kyle Tague`s warm but imposing voice soared to the stars. In Hearts Still Beating, Edenthorn have a bona fide classic in their hands of Stadium Rock proportions with Dylan Gardner`s chiming guitar and Tague`s impressive vocals combining to create something truly special. One listen to its delirious chorus is all it will take to have you hooked in an instant. Of course, the covers thrown in at the end including Nirvana`s Smells Like Teen Spirit and Pink Floyd`s Another Brick In The Wall were a bit of fun, but they were actually delivered in convincing style and the crowd clearly loved it. The show was not about covers though, it was all about Edenthorn and Exist, their new album and an hour and a half later there was no doubting that Edenthorn may well be putting Durham onto the musical map and this may turn out to be the “I was there” moment for those in the crowd. Durham alt-rock quartet EDENTHORN reveal the brand new video for single release ‘Mind Like A Minefield’, taken from their forthcoming album release ‘Exist’. The album is released on the 20th April 2018 and the new single premiered on Johnny Doom’s Kerrang Radio show earlier this month. Yesterday the video premiered with New Noise Magazine and can now be seen here below..
“‘Mind Like A Minefield’ is influenced by the experiences that we’ve all had with anxiety and panic attacks, and generally stressing out and overthinking things. The idea of battling with yourself and your mind, a war within yourself and your mind. The positive message in the track is ‘I will defeat it, I can beat it and in the end I will win the war within.” states the band when talking about the new single release. ‘Exist’ is self-released on the 20th April 2018. Introducing North East rock quartet EDENTHORN who will self-release their second album ‘Exist’ on the 20th April 2018. For fans of Thirty Seconds To Mars and Foo Fighters, EDENTHORN’S second album is offering is jam packed full of massive riffs, catchy choruses and melodic vocals to sing-along to. The band have already made Kerrang Radio’s Johnny Doom a fan, who recently aired the bands first single release, taken from the forthcoming album, ‘Heart’s Still Beating’. The single has also been championed by BBC Introducing Tees and North East and Primordial Radio, as well as an army of regional radio support. Check out the video for the single here below.. Hoping to daze their listeners with ‘EXIST’, it came naturally to the quartet from Durham to write the way they did. It is apparent that they have eclectic tastes in music and have written top-notch songs that have various different structures, tempos and emotions and for such a young band this is sure to catch the attention of many. ‘Exist’is self-released on the 20th April 2018. North East based Rock quartet, EDENTHORN, release a new single and video – ‘Heart’s Still Beating’ – on Friday 15th December 2017. The single is the first song to be taken from their forthcoming album, slated for release early April 2018. Singer, Kyle Tague, said, ” ”It is roughly 2 years since we released ‘The Maze’ album so it’s really exciting to have a full new album in the bag and this new single to release just before Christmas. We’re hoping it sets things up nicely for us going into 2018, kick-starting this new album run. I’d say it’s one of the more ‘uplifting’ sounding songs on this new record and we felt it was a good combination of the softer and the more heavy, darker side of Edenthorn both lyrically and musically and so seemed like the ideal track to pick for lead single. Cover Art and Video by: Ross Hannon – Aytball Film. EDENTHORN TEAM UP WITH CHARITIES FOR MENTAL HEALTH AWARENESS DAY! North East based, hard rock quartet, EDENTHORN, release a new single and lyric video – After The Storm – on Friday 8th September 2017 in time for World Suicide Prevention Day – Sun 10th September. The single is a remix of the original track taken from their debut album ‘The Maze‘, and will be available via all major music download and streaming services. After The Storm was written following the suicide of the cousin of the two brothers in the band, singer Kyle Tague (vocals) and Mark Tague (drums). Edenthorn have now decided to release the song as a single to raise awareness of suicide and mental health issues. Video by: Unit 15 Productions. North East based hard rock quartet, EDENTHORN, have announced a management deal with TMR Band Management and prepare a new album release for early 2018. After a well-received debut album ‘The Maze’ Edenthorn are ready to take it up a notch and show clear intent by signing with TMR. 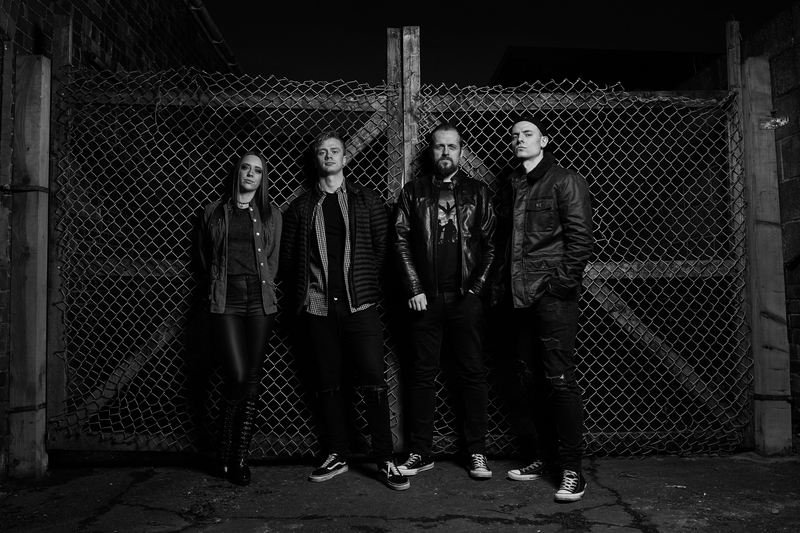 Edenthorn are a rare breed in that they are made up of not one but TWO sets of siblings, with vocalist Kyle Tague and drummer Mark being brothers; while guitarist, Dylan Gardner and bassist, Faiba Gabrielle are brother & sister. If you then add the fact that Kyle and Faiba are partners, it takes that traditional ‘we are a close-knit band’ adage to a whole new level. That family bond bleeds through into the music they produce where they create a unique blend of EPIC choruses, HUGE rock riffs and outstanding harmonies.